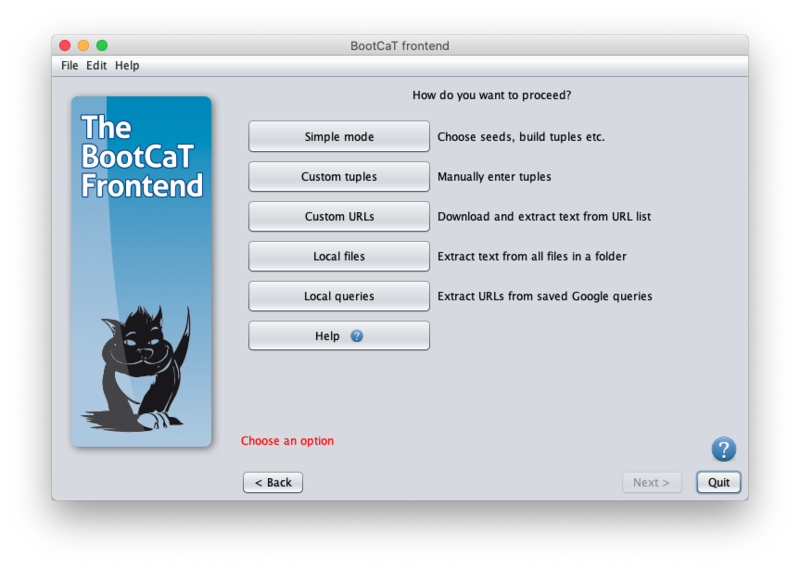 Version 0.71 of the BootCaT frontend introduced the possibility of skipping some of the steps involved in the corpus creation procedure. This is the standard method for creating a BootCaT corpus: you choose seeds, build random tuples, collect URLs and finally build the corpus. If you're a novice user this is the mode you should use (see the tutorial for more info on how to build a corpus). In this mode you skip the seed selection step and directly provide a list of tuples: a window will open and you'll be able to type in the tuples. After providing the tuples you will proceed normally: you'll collect URLs and then build the corpus. In this mode you'll skip directly to the final step, the one where the corpus is built using a list of Internet addresses (or URLs). You'll be asked to provide a text file containing one URL per line. You'll have to edit the list separately using a text editor (like Notepad for Windows or TextEdit for Mac) and save it in txt format. N.B. : only URLs pointing to HTML files will be downloaded (typical extensions for such files are .htm, .html, .php, .asp), if the list you provide contains URLs ending in PDF, DOC, DOCX etc. BootCaT will display an error and will refuse to proceed. In order to continue you'll have to remove the links to unsupported file formats from the list. Using this mode BootCaT will process all files contained in a folder (and its subfolders) on your computer. Files will be cleaned and a single text file will be created.